Short battery life and heavy batteries have previously ruled out battery powered garden machinery as an option for professional users. However, in recent years manufacturers have been investing in technologies that have resulted in more powerful batteries that are far more mobile. At The Mower Shop, we’re a Stihl stockist and wanted to highlight their great range of professional quality batteries and battery powered equipment. Known collectively as the Pro Cordless Power Tool System, the range includes a wide range of garden equipment including mowers, pole pruners, chainsaws, brush cutters, hedge trimmers, blowers, sweepers, cut-off saws and even powered pruning shears. All of the equipment in the Li Pro Cordless Power Tool System range operates from the same battery. Which, whilst being extremely convenient, also represents a saving over purchasing multiple different batteries. You have a number of choices when it comes to the battery you purchase. All of the batteries use the same advanced Lithium-Ion technology. 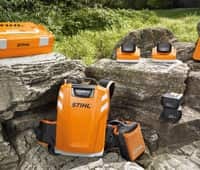 Stihl offers a number of battery sizes from the small AP100 battery which weighs 0.8kg right up to the large AR3000 backpack battery which weighs 8.2kg. The battery that’s right for you will depend on how much you plan to use your equipment in a single day. One of our team will be more than happy to advise you if you pop in or call us, but we’ve also included a handy table below that you can use to see estimated battery life. *All running times are based on using it with the HSA 86 and uses the technical data on Stihl’s website. Battery life will vary depending on the condition of use. You also have a choice to make when deciding on which charger you want to use with your battery. You can choose from the standard, quick and high-speed chargers. Your choice will most likely depend on the battery you choose and how frequently you use your equipment. Below, we’ve included a table showing the charging times for each of the batteries using the different chargers. Another benefit of using battery powered gardening equipment is the low cost to charge. The smallest battery, the AP100, costs only 2.2 pence to charge (at an assumed electricity cost of 14.37p per KWh). As well as being cheap to charge, the equipment motors are energy-efficient and non-wearing to ensure a long life. The table below shows the cost to charge of the different batteries coupled with the different charging options. The reduced weight of the modern batteries, such as the ones in Stihl’s Pro Cordless Power Tool System, makes them far more convenient and comfortable to use for long periods of time. The heaviest battery in the Pro Cordless Power Tool System range weighs in at 8.2kg and is carried in a backpack to make it easier to manoeuvre. The reduced weight and improved manoeuvrability means that the Stihl range is a real alternative to traditional petrol garden equipment for professional use. In addition, the reduced noise of the electric motor and the exhaust free operation makes it far more pleasant to use as an operator. The Mower Shop is an authorised Stihl dealer and has a range of battery powered garden equipment on display. Our team of experts will be more than happy to discuss your requirements and make recommendations to help you find the best tool for your use. We sell through high-quality service and competitive pricing. You can be sure that you won’t be subjected to a hard sell. Give us a call on 01788 510 453 or visit our showroom in West Haddon.